I think the only thing cooler than being an über-proud parent is being an über-proud sibling. And when you have a brother who is changing the campus dynamics of your local university, that's a pretty good reason to be extremely, extremely proud. 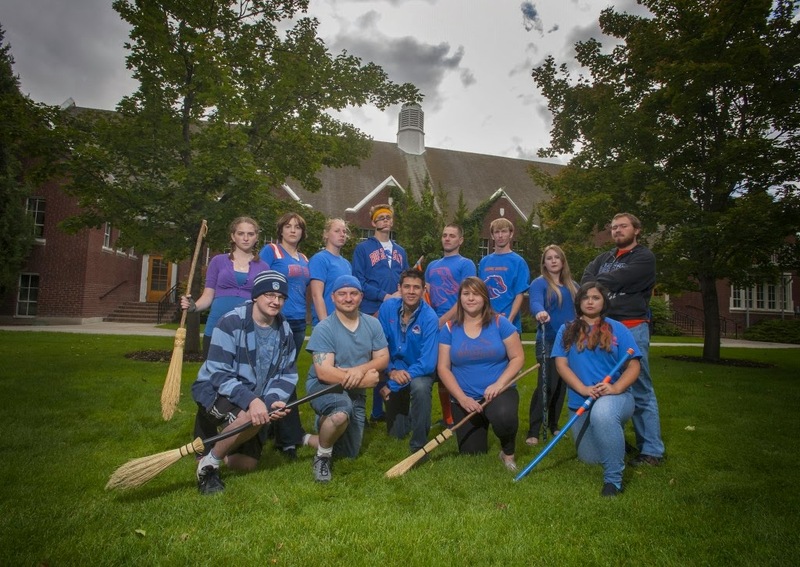 If you've been reading my blog for a while, you may remember my post in March about my brother, Stewart, & his Boise State University Muggle Quidditch team, the Abraxans. Just a few months ago, his team was simply a new club at BSU and he was just having a ball getting something new rolling over on campus. Fast forward a few months, and let me tell you—my brother and his team are rocking it. They are now an official university club, and boast a team of over 23 members. Stew has even been given a budget for the team, and they just had their first official jerseys made. They've played in tournaments in several different states including Utah and Nevada, and Stew has even traveled to California and Washington to play the Snitch for other tournaments. He was recently certified a gold rank Snitch, which is no easy task. 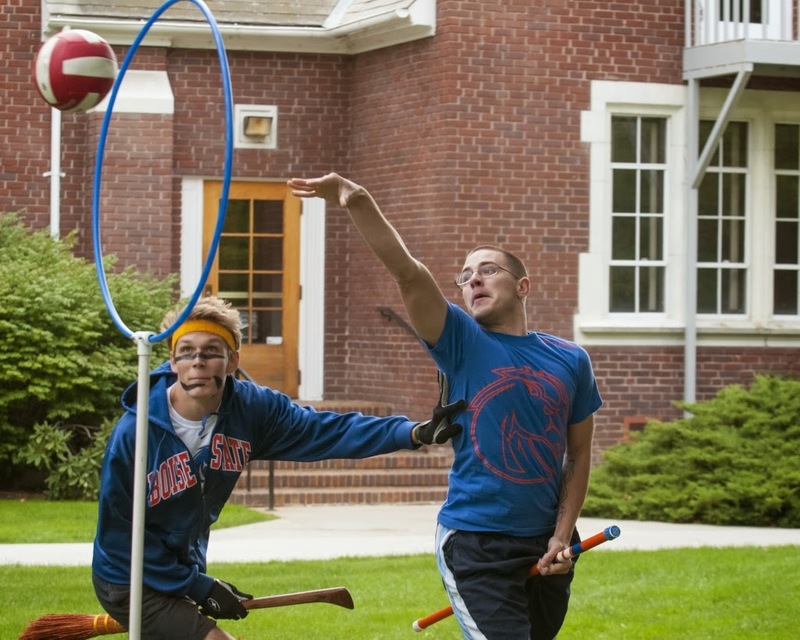 Yes, they play on brooms and act out the real-life version of the Harry Potter Quidditch... but it's cool. Really cool. It's a full combat sport and Stew has seen no shortage of injuries, including a broken tooth, torn ACL, sprained ankles, and he himself has seen the inside of the ER after a rough game where he suffered a break to his maxillary sinus. The Abraxans, once an unknown team running around the intramural field on campus, is now a team that is known throughout the students and professors at BSU. Stew's photo is on a rotating slideshow on the main Boise State website. Kids on campus know my brother, not because he's super tall or ruggedly handsome (you're welcome, Stew), but for how he's changing student life and pursuing his dreams. Oh, and did I mention he's a History Secondary Education major with a focus on Chinese? He wants to teach in China, people. My brother is a real-life rockstar to me. Stew-man, we're so proud of you and your go get 'em attitude. You and your team rock. Thanks for making me a proud big-sis, bro. Love you! That is seriously so cool. I want to play so bad! So fun! I love the picture of your brother! This is quite possibly one of the coolest things I have ever heard of. I'm forwarding this on to my husband to show him the awesomeness that is a real-life Quiddtich team! He's going to love it! Aunie, thanks for leaving me a comment sweets! Proud-sibling moments are one of my favorite parts at life. Go Stewart, way to do you! That's awesome. I am an uber proud sibling too - love this! So cool! I would love to see one of these in person! WHAT?! You've never read Harry Potter? It's a sport, similar to soccer but played on broomsticks. Players have to get the quaffle into the hoops to score points. There are all kinds of different factors that play into it, but the game ends when the snitch has been caught. In the muggle quidditch version, the snitch is a real person who runs around! You can read all about quittich here (http://en.wikipedia.org/wiki/Quidditch) and muggle quidditch here (http://en.wikipedia.org/wiki/Muggle_Quidditch)! It looks like a lot of fun. Though the players are SO aggressive! They tackle people all the time! You have to let me know what he said. I think it's pretty awesome, too! YESSSSSS!!! Bro Sauce! I love that. That's so awesome! That would be the position I would NEVER want to play... it looks really hard! Good for her... so fun that she loves it. It's a great sport! YOU are awesome. I would say it does... only because everyone in my family is someone I could brag for days about! OOH ooh, tell me why you're proud :) Would love to know how awesome your sibling(s) is(are)! It's really, really fun. The game is very fast-paced. It's a lot more aggressive than you'd think... it's fun to watch! Sadly, I am way, way out of the pop culture loop when it comes to Harry Potter. This sounds amazing though! I think I would love it! I just saw the following and couldn't help but think of your brother's league. They are official quidditch jerseys. I'm not sure if they'd be interested in them or not but it looks like you can personalize them with your own name. I love it!!! I think it's also hilarious that they have the Quidditch cap and goggles. I am going to show him this... he'll love it!